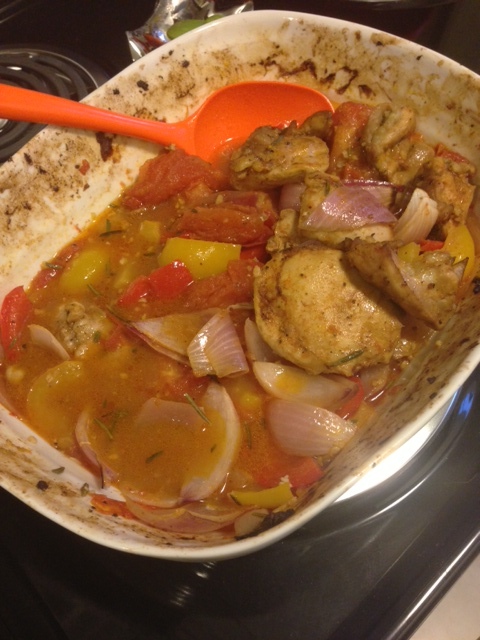 Pan-Baked Chicken and Veggies | So Hungary! I love eating vegetables, and love to eat them pretty much any way they come – raw, steamed, baked, stir-fried – you name it! 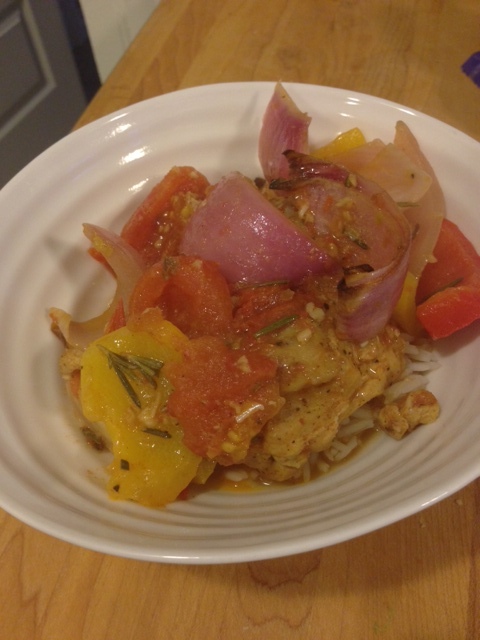 I also love to have a few go-to recipes on hand that are healthy and quick to throw together on a week night, especially when our schedules are so busy and we either don’t have time to make a big meal, or really don’t feel like it. This recipe uses a lot of fresh veggies, combined with chicken thighs (which I love way more than chicken breast) and just a simple, light sauce. You can service it on its own with a green salad, or with quinoa, rice or crusty bread to soak up the extra juices! The juice from the tomatoes releases as it bakes, making the simple dressing of olive oil and balsamic vinegar that much more tasty in the end. I think this recipe will be added to our favorites, and we will definitely be whipping this up on a regular basis. The great thing about this recipes is you can definitely modify it to suit your favorite mix of vegetables and still be delicious! I hope you enjoy this as much as we did! Preheat your oven to 350 degrees. Cut your tomatoes into quarters. Peel your onion and cut into large chunks/wedges. Roughly chop and seed your peppers. Throw all these chopped veggies into a large baking dish or roasting pan. Mince your garlic and add it to the pan, along with the chopped Rosemary. Add your chicken, paprika, olive oil, balsamic vinegar, salt and pepper. Toss all the ingredients together well, and once everything is coated evenly, pull your chicken thighs to the top and have them sit on top of the veggies. Pop the whole baking dish in the oven for about 1 hour. Around the 30 minute mark, flip your chicken and give the veggies that are now getting juicy a good stir. Once the chicken is golden and cooked through, remove your tasty dish from the oven and let it cool for a few minutes. Pat and I enjoyed this over rice and it was delicious! What modifications did you make to yours that made it extra delicious? i make something similar to this almost weekly.. never thought of adding balsamic to the mix though!